It’s that time of year again! August, the birthday month for many an EDHREC author including Joey Schultz, Sam Alpert and yours truly. For our birthdays, Wizards has decided to release the yearly commander product in August again! Now there may have been a bit of a kerfuffle about what exactly a “Jund lands” deck is, and the reprints in the decks may be somewhat…lackluster…. But! The new cards coming out in this set are some of the most interesting and exciting cards we’ve ever seen in a Commander product. Let’s take a look at this set’s new artifacts, lands, and the remaining multicolored cards not already covered by Mason’s extensive review. Ready? Let’s get to it! 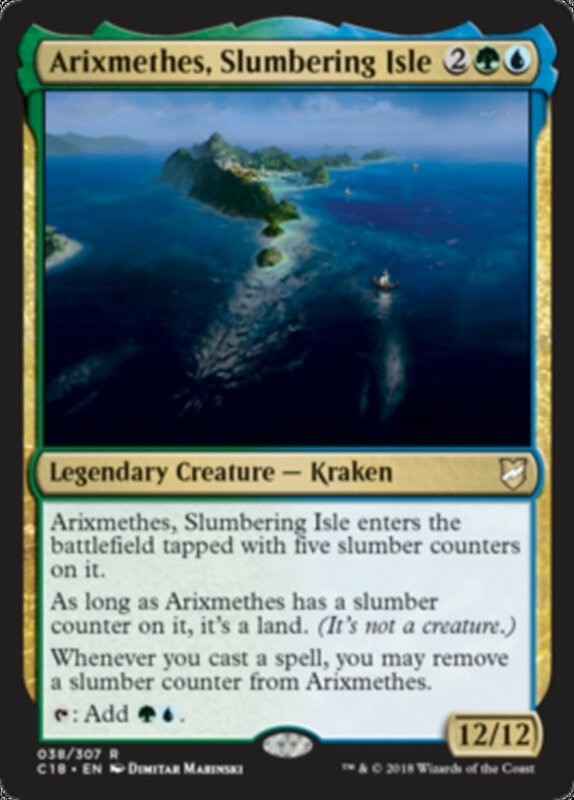 Well, with Arixmethes, Slumbering Isle you can finally cast a land card, and it’s… about as weird as you’d expect. Luckily, it’s also super cool. Playing this in Rashmi, Eternities Crafter or Yidris, Maelstrom Wielder should make it really easy to burn through Arixmethes’s slumber counters, turning him into a nasty 12/12 beater very quickly. However, you’ll probably want to add some evasion or he’ll likely get chump-blocked every time. There’s some combo potential with him and cards like Freed from the Real, which will let you make infinite green mana. Note that with two slumber counters on him, he will survive if you cast a board wipe, but with one slumber counter, he will not, because the counter will be removed before the spell resolves. Wow. Xantcha, Sleeper Agent is just awesome. She has some similarities with Ruhan of the Fomori, in that you drop an extremely efficient beater in the early game, but don’t get to control exactly what it does. Even though her stats are smaller, Xantcha is way more interesting to me than Ruhan. She comes down a turn earlier, enters under an opponent’s control (I recommend that you don’t give her to the opponent playing black), and has an ability that lets any player draw a card and make her controller lose two life. Xantcha is the feature of the ‘Action’ segment at the end of this article, and you’ll get to see some of the cool cards that pair up well with her there. Aside from the cheesiness of “Commander Ninjutsu” (didn’t Megamorph teach you anything, Wizards? 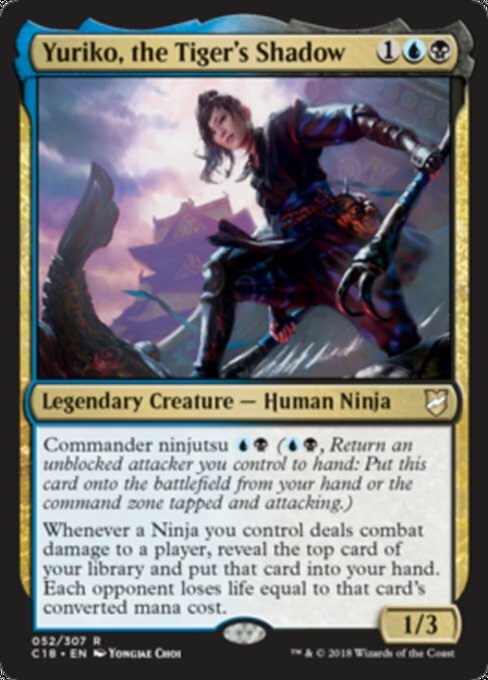 ), Yuriko, the Tiger’s Shadow is a really cool commander and the Ninja commander of many people’s dreams. Her reverse Dark Confidant ability is strong, and tying it to combat damage is interesting. Unfortunately, the lack of Ninjas in Magic means you’re going to be relying on Changelings and cards like Conspiracy, Xenograft and Arcane Adaptation to turn your team into Ninjas. I really like Yuriko in Sygg, River Cutthroat, with or without Ninja support. Hello, Valuetown, it feels good to be home. Windgrace’s Judgment has some incredible power packed into a single card. This is like Grasp of Fate, but so much better. It’s instant speed, and unlike Grasp you don’t have to worry about someone Wrathing the board and giving your opponents back their big, juicy targets. If you’re running BGx make room in your deck for this card ASAP. This is…a card? Ancient Stone Idol is interesting, but I’m not sure where it’s meant to go. I suppose I could see it going in fair Animar, Soul of Elements decks. The first two abilities read like a time-restricted Convoke variant, which is unique. As a 12/12 with trample, it is an extremely threatening damage-dealer. 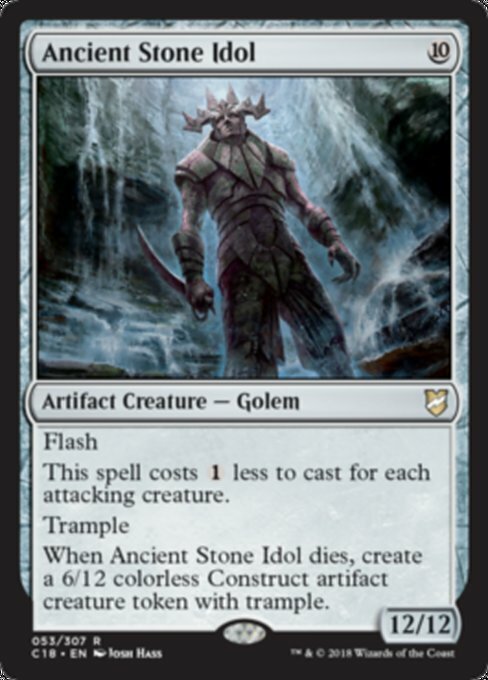 The fact that it replaces itself with a 6/12 copy of itself when it dies it, again, weird, but cool flavor (re: Stone Idol Trap). 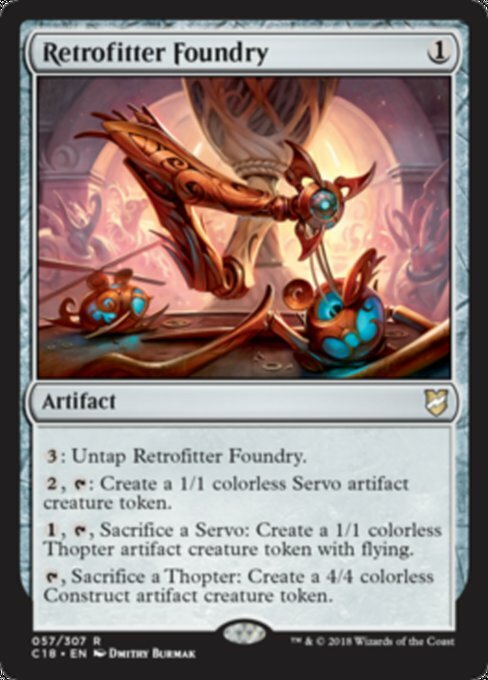 I really want to liken this card to Wurmcoil Engine or Darksteel Golem, and I guess that’s the most apt comparison to be made, but they’re really too different. The cost is reduced if a lot of creatures are attacking, but it can only block one of them, so this creature is, unfortunately, somewhat awkward. 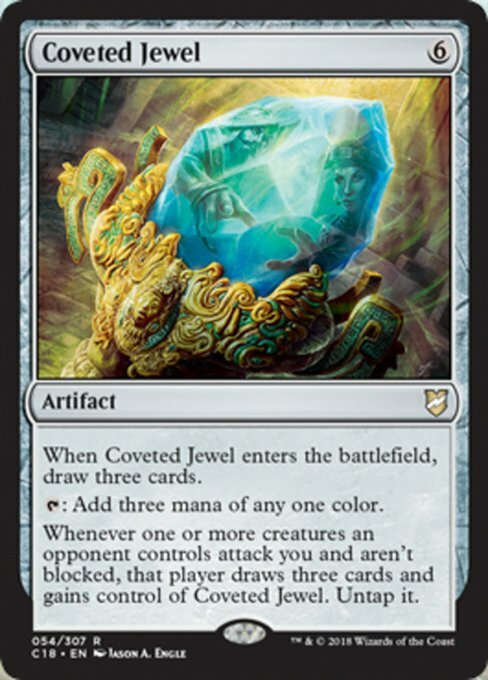 Coveted Jewel seems like a risky Gilded Lotus variant. Drawing three cards is a great add-on, but you need to consider whether you want your opponents to be able to do the same. In general, there are two kinds of decks that will play this card: decks that want to encourage lots of attacking (our Xantcha, Sleeper Agent deck will fall into this category), and prison/stax decks (ie Teferi, Temporal Archmage). For the former archetype, I think this is a fun add. For the latter archetype, it’s pretty much just another combo piece. Throw a comment in the comment section below and let us know what you’re planning to do with this card; politics or prison? Endless Atlas is great for mono-red and mono-white decks. 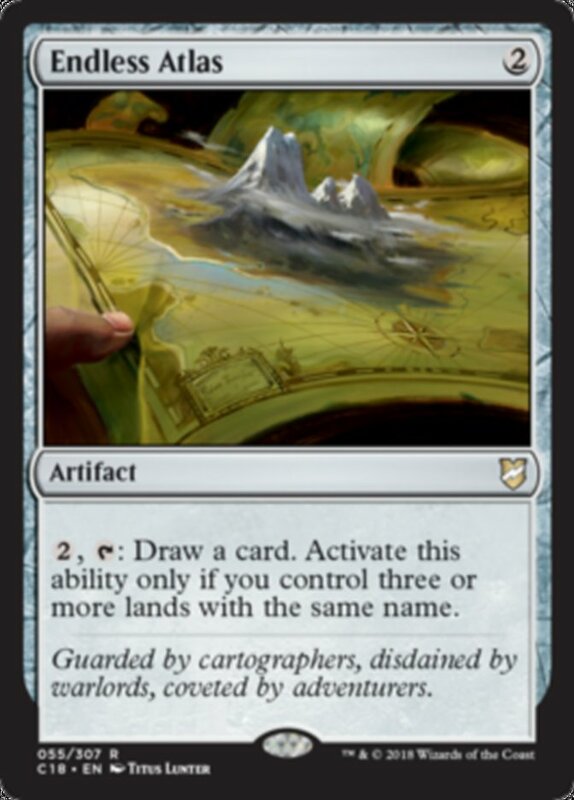 It’s pretty easy to get three mountains or plains out by turn three, and dropping this on turn two sets you up neatly to start drawing cards early. Late game, this will let you pay four mana to draw a card right away, which isn’t terrible at all. I think Endless Atlas is also playable in two-color decks, though it will be more unreliable, obviously. For decks that are three colors or more, it seems like a very ill-advised idea, unless you play the deck as mostly one- or two-color with just a splash of the others. I’m going to be dropping this into Teshar, Ancestor’s Apostle as soon as I get my hands on a copy. 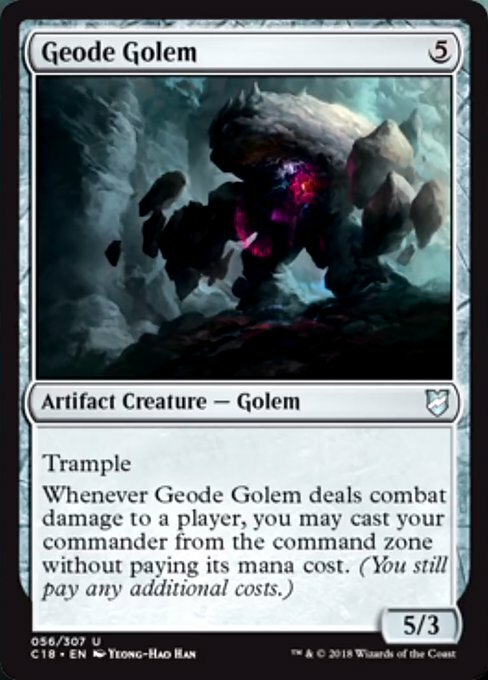 Geode Golem is a sort of animated Command Beacon, I guess? Wizards keeps getting more creative with ways to circumvent command tax. I can’t decide if it’s worth running, though. This is a five-mana investment with a very low toughness, so it’s not going to stick around long. I think that in many of the instances you play this creature, you’ll be able to use its ability once, but then it dies that combat. The best decks for this card are probably reanimator/recursion decks and Voltron builds. Recursion is obvious – you just keep bringing it back, and it keeps bringing your commander back. For Voltron decks, though, you can protect it by suiting it up with the gear that your commander left behind when it went to the command zone, and potentially keep it around for a few more uses. Retrofitter Foundry feels like a combo loop just waiting to happen… and it is! Adding Anointed Procession and Clock of Omens lets you double your token production and untap the Foundry. Adding Krark-Clan Ironworks or Ashnod’s Altar lets you sac those tokens for mana to use to make more tokens. Adding Blasting Station or Blood Artist brings the combo home letting you ping all of your opponents down to nothing. This is probably just one of many, many ways to abuse Retrofitter Foundry, so watch out. Forge of Heroes is this year’s Opal Palace variant. 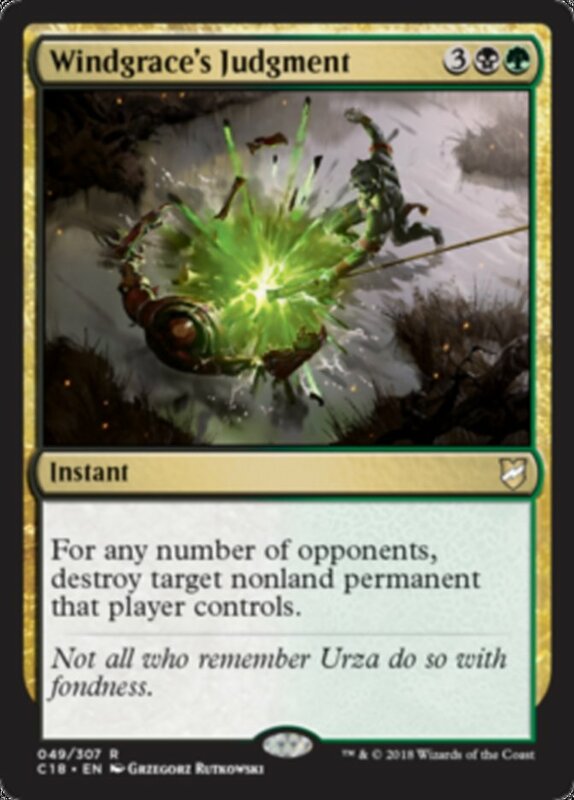 Unlike Palace, Forge will only ever add one counter to a commander. 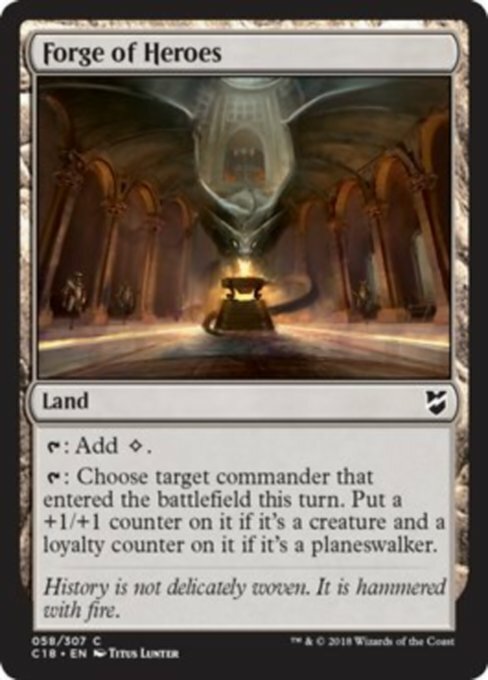 This card is definitely good for commanders where +1/+1 counters matter (like Marath, Will of the Wild), possibly good for Voltron commanders (specifically Voltron commanders with six power like Palladia-Mors, the Ruiner), and naturally, good for planeswalker commanders. I think the last category is where this card shines most. Getting free loyalty counters can be the difference between getting off a planeswalker’s ultimate and losing the game. 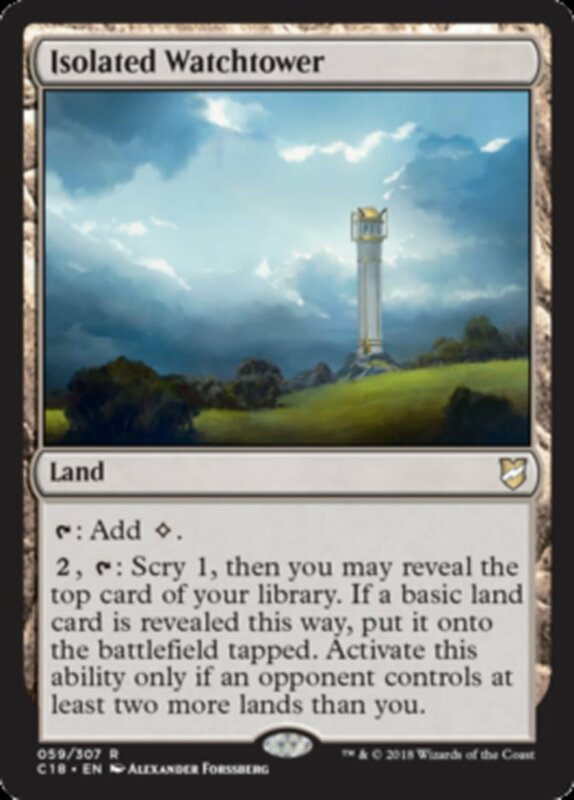 Isolated Watchtower is one of my favorite new cards from this set. Putting repeated scry with a cheating-lands-into-play ability stapled on is a great addition to the game. It’s unfortunate that you can only activate the ability while you’re behind on lands, but this card still works in any non-green deck. This will probably replace Terrain Generator in many decks; I know I’m probably going to swap it out in my Korlash, Heir to Blackblade deck. 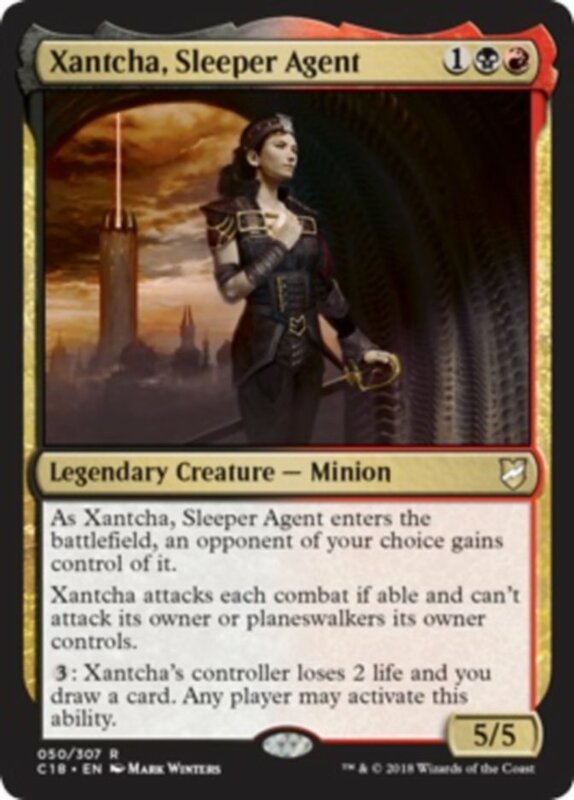 For the Action segment in this preview article, I’m going to share the first draft of my Xantcha, Sleeper Agent brew. The idea is to drop Xantcha early and suit her up with some very nasty auras like Treacherous Link while keeping her alive with cards like Undying Evil. Even though some of these effects say they’ll return Xantcha under your control, Xantcha herself will actually just choose another opponent! While your opponents are busy dealing with her, you get to set up your board for the late game, dropping spiked pillows like No Mercy and Dread]. Some fat beaters like Sower of Discord, Wurmcoil Engine, and Kaervek the Merciless help to close out the game. 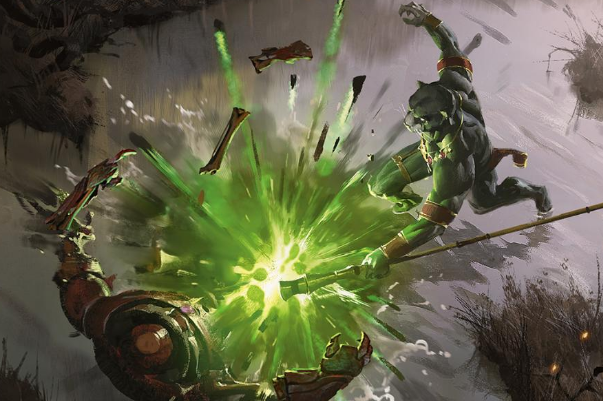 The deck also encourages lots of back-and-forth attacking and interaction with cards like Coveted Jewel, Contested War Zone, Crown of Doom, and Marchesa’s Decree. In its current stage, the deck lacks board wipes, as I’m expecting this brew to draw out my opponents’ board wipes to try deal with the threats it drops. Instead, I’m running Thrilling Encore to keep the games going. Let me know what you think in the comments below! Tell me if you’re brewing Xantcha a different way, and what you think of all these new treasures from Commander 2018!